This report on the global cryptococcosis market analyzes the current and future scenario of the global market. Cryptococcosis disease burden is rising due to increase in susceptible patient population such as HIV-infected patients, solid organ transplantation recipients, and other immunosuppressive hosts. In addition, the huge patient base in Sub-Saharan countries fuels the growth of the cryptococcosis market. For instance, According to CDC, it is estimated that around 1 million cryptococcal meningitis cases occurs globally. Also, it is also seen that cryptococcosis mortality burden is very high which results in around 625,000 deaths every year. 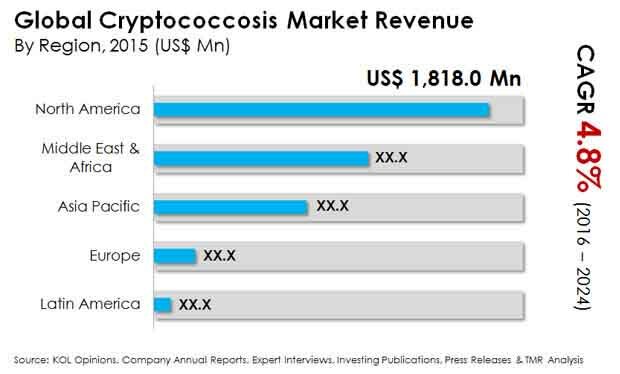 In addition, rise in private and public funding for creating awareness, and favorable regulatory scenario for new product launch are boosting the growth of the global cryptococcosis market. The cryptococcosis market report comprises an elaborate executive summary, which includes market snapshot that provides information about various segments. It also provides information and data analysis of the global market with respect to the segments based on treatment, distribution channel, and geography. A detailed qualitative analysis of drivers and restraints, and opportunities has been provided in the market overview section. Additionally, the section comprises clinical trial analysis and key industry event analysis to help understand the competitive landscape in the market. This section also provides market attractiveness analysis in terms of geography and market share analysis by key players, thus presenting a thorough analysis of the overall competitive scenario in the global cryptococcosis market. Based on treatment, the market is segmented into Amphotericin B, Flucytosine, Fluconazole, and other antifungals. Amphotericin B further segmented into Amphocin, Fungizone and other products. Flucytosine further segmented into Ancobon and other products. Fluconazole includes Diflucan and other products. In treatment type, Flucytosine was the largest segment of the global cryptococcosis market in terms of revenue in 2015, driven by its increasing adoption in U.S. The market segments have been analyzed based on cost-effectiveness of the drugs, prevalence of the diseases, and growing diagnosis rate of cryptococcosis across the globe. The market size and forecast for each of these segments have been provided for the period from 2014 to 2024, along with their respective CAGRs for the forecast period from 2016 to 2024, considering 2015 as the base year. Based on distribution channel, the global cryptococcosis market is segmented as hospital pharmacies, retail pharmacies, drug store, and mail order pharmacies. Retail pharmacy was the largest segment of the global market in terms of revenue in 2015 and is expected to continue to dominate the market by 2024, which is attributed to the increasing contribution of long term medication required for cryptococcosis treatment. Online purchase of drugs has been highly popular in most of the developed economies such as the U.S. and Japan. Geographically, the global cryptococcosis market has been categorized into five major regions and the key countries in the respective region: North America (U.S. and Canada), Europe (U.K., Germany, France, Spain, Italy, and Rest of Europe), Asia Pacific (India, Japan, China, Australia and Rest of Asia Pacific), Latin America (Brazil, Mexico, and Rest of Latin America) and Middle East & Africa (South Africa, GCC Countries, and Rest of Middle East & Africa). The report also profiles major players in the global cryptococcosis market based on various attributes such as company overview, financial overview, product portfolio, business strategies, SWOT analysis, and recent developments. Major players profiled in this report include Bristol-Myers Squibb Company, Janssen Biotech, Inc. (Johnson & Johnson), Abbott Laboratories, Novartis AG, Pfizer, Inc., Valeant Pharmaceuticals, Inc., Glenmark Pharmaceuticals and Sigmapharm Laboratories LLC.